What Your Church Website Needs | Infomedia, Inc. Although worship services are a large part of a church, ministries hold an important role as well. Highlight these branches of your congregation, everything from small groups to choir concerts, by dedicating a page (or pages) to ministries. If you only have a handful, we would recommend listing them together on a single page. If you have an extensive collection of ministries that require a lot of information/page space, then it’s probably better to build a page dedicated to each ministry. 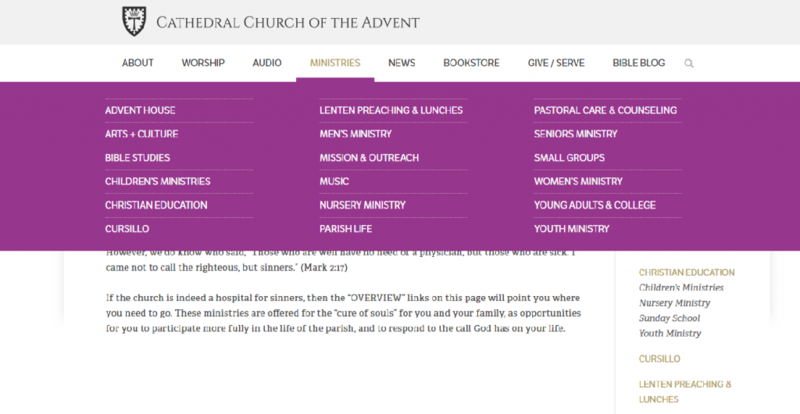 We love how Infomedia client Cathedral Church of the Advent uses a colorful drop-down menu so their ministries stand out. Any website for a brick-and-mortar business or organization should have their open hours on the homepage, and churches are no different. List your service schedules in a prominent place on your site so visitors (or forgetful congregation members) can find out when things are happening. Some times and dates to include: Bible study, worship services, communion and any other regularly scheduled occurrences like prayer groups. Reserve one-time or irregularly occurring services for your events page (see below). A large portion of your website traffic may be from potential visitors researching your church. Having a labeled “Visitors” page dedicated to newcomers will give them an easy spot to find out everything they need to know. Some things to consider including on a visitors page: a brief summary of your church’s history, short bios of key church staff members, an overview of what doctrine you follow, service times and location information. If you want to be even more thorough, you can have a FAQs page that includes more detailed descriptions. Briarwood Presbyterian Church, an Infomedia client, breaks down basic questions in their Visitor FAQs section. Since churches are so social, it makes sense that an array of events are usually happening throughout the year. Having them all arranged in one spot will make it easier for the congregation and visitors to keep track of the goings-on. From your summer potluck to the Christmas choir concert, list your events on a calendar (or in list format) for a clean and organized look. 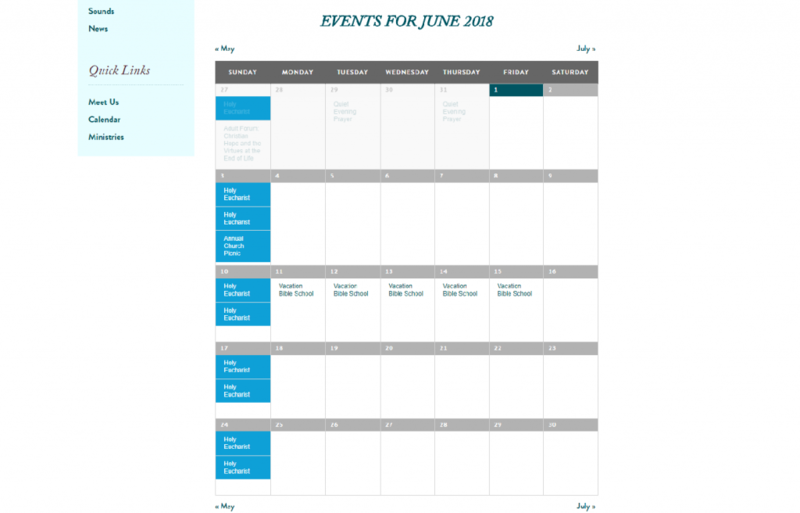 Infomedia Client St. Francis Episcopal Church has their events neatly organized on a dedicated calendar page. You can toggle between list and calendar views for easy reading. If your church or place of worship is in search of a new website, Infomedia would love to work with you. Simply contact us to start a no-commitment conversation about your organization’s needs and learn about the various services we have to offer.